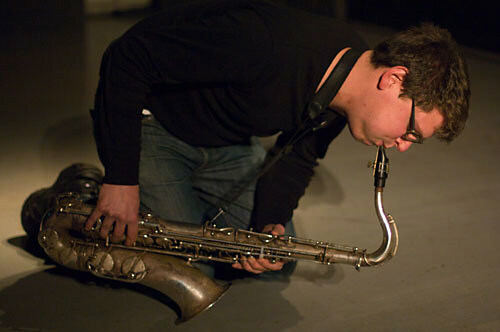 Antoine Chessex, born in 1980 in Switzerland, is a key spoke in the wheel of Europe’s experimental music community, and a hub in the electro-acoustic improvising scene. Based in Berlin, he performs internationally with various projects including the noise-metal outfit Monno. After saxophone studies in Lausanne, Sienna and New York, he moved to a more radical approach including different forms of sonic experiments. Parallel to his acoustic playing, he developed an unusual use of the saxophone while sending it through a Marshall guitar amplifier and using circular breathing techniques. Drones, vocal mayhem and chaotic electronic behaviour is mixed together in an extremely intense manner.